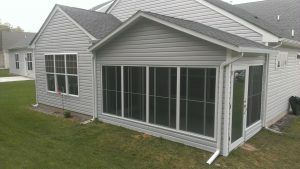 Patio enclosures are great options for homeowners in Hockessin, Delaware, who are looking to add additional living space to their homes, but also enjoy taking in the fresh air and views of their own backyards. These stunning structures protect against common outdoor annoyances such as insects, UV rays, inclement weather, and windblown debris, so you and your family can spend time in the great outdoors while remaining comfortable and protected. Studio – This style is our most versatile patio enclosure, as it is available in 1-, 2-, and 3-wall configurations. Studio patio enclosures also work well with both one- and two-story homes. Cathedral – Cathedral-style patio enclosures have a lower back wall height and gorgeous vaulted ceilings that look best with single-story homes that have traditional construction. You can also choose to equip your Cathedral-style patio enclosure with glass top and bottom walls for additional protection from the outdoors. Both of these styles are made with heavy-duty aluminum that will allow your patio enclosure to withstand the elements for years to come without becoming damaged. Our patio enclosures also feature lightweight, removable vinyl sashes. When on, these sashes block up to 99 percent of harmful UV rays and provide additional protection from wind and rain. When the weather is nice, simply remove the sashes to enjoy maximum ventilation. To top it all off, our patio enclosures have solid thermal roofs that deflect the sun’s heat, helping to maintain a more comfortable temperature inside the enclosure even when the weather is at its hottest. To learn more about the benefits of having SRA Home Products install one of our durable, stylish patio enclosures at your home in Hockessin, DE – including the manufacturer’s incredible lifetime transferrable warranty – contact us today. A member of our team will be glad to schedule you for a free at-home consultation.